(17) Davenport mdl. B 5-Spindle Automatic Screw Machines s/n’s 10785, 8875, 7474, 7149, 6369, 5730, 5586, 5482, 5131, 4828, 4726, 4078, 3377, 2246, 2232, 2148 w/ Drill Stations, 5-Cross Slides, Spindle Stop Clutches Installed, 2496-42 Spindle Brake, reading Attachment, Pickup Attachment, Pneumatic 5C Closer, Double Acting and Single Acting Chip Conveyors, Bar Feeds. (2) Acme – Gridley mdl. RA-6 1 ¼” 6-Spindle Automatic Screw Machines s/n’s 71748, 71025 w/ Drill Stations, 5-Cross Slides, Work Stop, Misc Accessories, Bar Feeds.Brown & Sharpe No. 2G 1 ¼” Automatic Screw Machine achment, 3-Cross Slides, Bar Feed. Brown & Sharpe No. 2 1 ¼” Automatic Screw Machine s/n 542-2-3587-1 ¼ w/ 6-Station Motorized Live Turret, 3-Cross Slides, Bar Feed. Brown & Sharpe No. 2 1 5/8” Automatic Screw Machine s/n 542-2-6388-1 5/8 w/ 6-Station Turret, 3-Cross Slides, Bar Feed. w/ 6-Staion Turret, 2-Cross Slides. (2) Brown & Sharpe No. 00G ½” Automatic Screw Machines s/n’s 20605, 20458 w/ 6-Station Motorized Live Turret, Slotting Attachment, Cross Drilling Attachment, 3-Cross Slides, Bar Feed. (4) Brown & Sharpe No. 00G ½” Automatic Screw Machines s/n 20579, 20271, 17343, 16588 w/ 6-Station Turret, 3-Cross Slides, Bar Feed. (3) Brown & Sharpe No. 00 ¾”and ½” Automatic Screw Machines s/n’s 542-00-7400, 542-00-7399, 542-00-4291 w/ 6-Station Turret, 3-Cross Slides, Bar Feed. (2) Kearney & Trecker No. 8 ½” Automatic Screw Machines s/n’s 85293, 85047 w/ 6-Station Turret, 3-Cross Slides, Bar Feed. Pave Micro-6 CNC Wire Bender. RMG Rockford Mfg. mdl. 4SV16 Automatic Straightening and Wire Cutting Machine s/n 0802342 w/ 3/8” Cap, Shear, Catch Trough, Wire Spool Feed Reel (NEW IN CRATE). Lewis Machine mdl. 2SV5 Automatic Straightening and Wire Cutting Machine s/n 2SV5-216-6 w/ 3/8” Cap, Die Sets, Shear, Catch Trough, Wire Spool Feed Reel. Rousselle No. 4B 40 Ton Gap Frame Stamping Press s/n 13175 w/ 18 ¼” x 59 ½” Bolster Area, 14 ¼” x 36” Ram Area. (3) Chicago mdl. 131 18GA 11 Ton x 48” Press Brakes s/n’s LW-12027, LW-8713, LW-6974 w/ 6” roat, 30 ¾” Between Uprights. Bliss No. 4 40 Ton OBI Stamping Press. Rousselle No. 0A OBI Stamping Press s/n 1960. (3) Bliss No. 19C and No. 19 ½ OBI Stamping Press. Minster No. 4, Murch & Gray, Press Rite No. 1 and No. 0 and Benchmaster OBI Stamping Presses. 1996 Master-Cut mdl. S-300HA Automatic Hydraulic Horizontal Band Saw s/n 11721 w/ Hydraulic Clamping and Feeds, Chip Auger, Conveyor,Coolant. (2) Taylor Wineld 75kVA x 24” Spot Welders s/n’s 44875, 44874 w/ Entron Controls, Pneumatic Down Feed. Taylor Wineld 75kVA x 18” Spot Welder s/n 6383 w/ Entron Controls, Pneumatic Down Feed. Terry Bar 10-Tube Hydraulic Bar Feed w/ .250” to 2.5” Cap. Chip Spinner and Oil Recovery Unit. Haskins Type 1CAM Pneumatic Drilling Tapping Machine w/ Snow Tapping Heads. Speedycut mdl. ST-1V2 Automatic Tapping Machine. Custom 2-Head Automatic Drilling Machine w/ Desoutter Pneumatic Actuated Drill Heads. Bellows Locke mdl. 5E Automatic Drilling Machine s/n 2815C. Custom 2-Head Automatic Drilling Machine w/ Dumore Auto Drilling Heads. Sullair mdl. LS-10 25H AC/AC Rotary Screw Air Compressor s/n 003-98542. Sullair mdl. SRD105 Refrigerated Air Dryer. Dayton 7.5Hp Horizontal Air Compressor w/ 2-Stage Pump, 120 Gallon Tank. Dayton 5Hp Horizontal Air Compressor w/ 2-Stage Pump, 60 Gallon Tank. 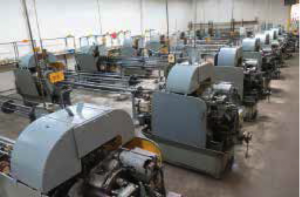 (2) Custom Pneumatic Slitting Machines. (11) Drum and Mixer Style Media Tumblers. Elma E60H and LC60H Ultrasonic Cleaning Tanks. Abbott “Clear-Pak” Blister Packaging Machine. AMP mdl. C-2 Automatic Crimping Machine s/n 50314. 1996 Mighty Comet mdl. VMC-500P CNC Vertical Machining Center s/n 95122202029 w/ Mitsubishi Controls, 16-Station ATC, BT-40 Taper Spindle, 60-6000 RPM, Travels “X”=21”, “Y”=16”, “Z”=20”, 15.5” x 32” Table, Coolant. (2) 1998 Tongai Titan “Cheetah 400” mdl. TVD-400 CNC Drilling / Tapping Centers s/n 7969, 7968 w/ Fanuc Series 0M Controls, 10-Station ATC, BT-30 Taper Spindle, 120-12,000 RPM, 12.6” x 19.7” Table, Coolant. Mori Seiki SL-15 CNC Turning Center s/n 466 w/ Fanuc 10T Controls, 12-Station Turret, Hydraulic Tailstock, 6” 3-Jaw Power Chuck, Coolant. Femco WVCL-10/25 CNC Turning Center s/n 2001 w/ Fanuc Series 10T Controls, 12-Station Turret, 6 ½” 3-Jaw Power Chuck, 5C Collet Nose, Chip Conveyor. Victor mdl. 1640S 16” x 40” Geared Head Gap Bed Lathe s/n S8306039 w/ 55-2000RPM, Inch/mm reading, Tailstock, Steady and Follow Rests, 5C Collet Closer, Dorian Tool Post, 10” 4-Jaw Chuck, 8” 3-Jaw Chuck. Lin Huan mdl. SOM-5C Second OP Lathe s/n 682950 w/ 6-Station Turret, Cross Slide, 5C Collet Closer. Sprint mdl. FH-60 Turret Lathe w/ 85-3500 RPM, 6-Station Turret, 5C Collet Closer. Bridgeport Series 1 – 2Hp Vertical Mill s/n 199164 w/ 60-4200 Dial Change RPM, Chrome Ways, Power Feed, 9” x 42” Table. Maxmill – Yamazen mdl. YC-1 ½ VA Vertical Mill s/n 102754 w/ 3Hp Motor, 80-2720 RPM, Power Feeds, 9” x 42” Table. Lagun mdl. FT-1 Vertical Mill s/n 7035 w/ 55-2940 RPM, Power Feed, 9” x 42” Table, Select Type ½ Vertical Mill s/n 63833 w/ 12-Speeds R8 Spindle, 7” x 30” Table. Golk Vertical Mill s/n 526234 w/ 8” x 47” Table. Milwaukee Kearney & Trecker mdl. 7 ½ HP-2CK Horizontal Mill s/n 7-6809 w/ 15-1500 RPM, Power Feeds, 50-Taper Spindle, Arbors and Support, 13 ½” x 56” Table. Milwaukee Kearney & Trecker mdl. 205 S-12 Universal Mill w/ 25-2000 RPM, 50-Taper Spindles, Power Feeds, 12” x 56” Table. Sajo mdl. UF-54 Horizontal Mill s/n 24 w/ 39-1500 RPM, 50-Taper Spindle, Power Feeds, Arbors and Support, 11” x 47” Table. U.S.Multi-Miller mdl. M-1 Horizontal Mill s/n MM1-6-636 w/ 40-Taper Spindle, Arbors and Support. dles, 10” x 37” Table. Cincinnati mdl. OM Centerless Grinder s/n 2M2H5E-11 w/ Hydraulic and Manual Wheel Dressers, Coolant. Reid mdl. 2-B 6” x 18” Automatic Surface Grinder w/ Electromagnetic Chuck. Kent mdl. KGS-200 6” x 14” Surface Grinder s/n 800236-20 w/ Magnetic Chuck, Wheel Dresser. Black Diamond mdl. BW80 Precision Drill Sharpener. Height, Side Shi Cushion Tires.